I was about to write the update and the phone rang. Lily had been seen. I grabbed a camera, jumped in the pickup, and started driving. The neighbor told which way she was headed. LilyI headed her off, arriving at what I thought would be her destination. Catching up with the neighbor there, I was about to leave when Lily appeared. I had dreams of going out his basement door and saying “It’s me bear” and having her come to me like no time had passed. I said the words, and she didn’t even look up. It’s like I was walking in the woods with her and she would completely ignore me as inconsequential and go about her life. I walked toward her and offered her some hazelnuts. She didn’t look up at me. She sniffed the hazelnuts and went back to what she was eating. I lay down about 8 feet away to get a picture. She was engrossed in what she was doing. I made a high-pitched shhh sound. She’d heard it before and paid no attention. After a minute she looked around—not at me but as if she was just checking that the noise wasn’t coming from somewhere else. I clicked. Said “Thank you, bear,” and headed back to write the update. It’s not that we didn’t know what she has been up to. A couple days ago, a trail cam caught her with a big male at night. Couldn’t tell his identity. Today she is alone. Is mating season over for her? We’ll see. Things are getting exciting. As seen in the photo, mosquitoes were everywhere. But, they were the slow early type that land and are easily removed with a brush of the hand, unlike the later type that are quick and tough to swat. Lily's solution was to simply ignore them and eat. 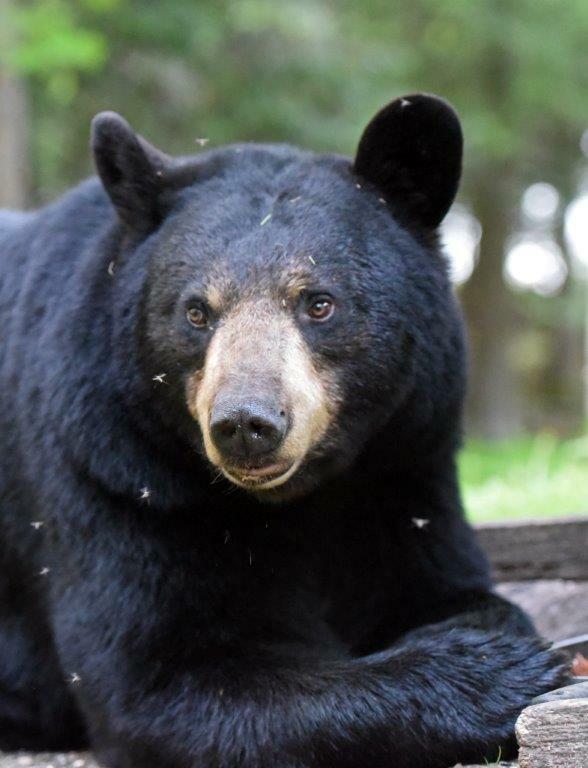 Bears don't slap at mosquitoes like they sometimes do for horseflies and deer flies that hurt when they bite.